This Wednesday, after being in the prep lab for about five minutes, tiny hell broke loose because of a surprise visit by some mite researchers. They were coming in to the museum to try and extract a type of nasal mite that is found in the nasal passages of Yellow-bellied Sapsuckers. The mite is a possible relative of the common dust mite. In any regard, Dr. Willard was having to drag out many frozen sapsuckers in preparation for their research, as it seemed only one in five of the birds actually had the mite. I've been working on so many warblers with "Dendroica" as part of their scientific name, I've begun to think it'd be a good name for a first born. 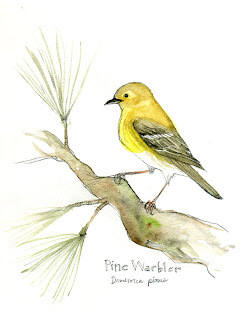 The Pine Warbler is a denizen of the pine forests of the eastern US, with higher population densities in the southeastern portions. It is one of the few wood warblers (family: Parulidae) that regularly consumes seeds. Despite it being somewhat widespread, there is little information regarding its breeding and nesting habits. This may be due to it nesting in high pine trees, making it difficult for observation. Last night I was stressed out and so popped in an episode of David Attenborough's "Life of Birds". Nothing like a clipped English accent of a great, curious mind, to put one at ease. I respect what Attenborough has done to bring the wonders of the natural world to so many. I love his dignified, congenial manner, even when standing smack in the middle of huge colony of sooty terns. One of my favorite scenes is of him in his khakis and windbreaker jacket crouched over on a dark, wet New Zealand beach speaking in excited, hushed tones about the amazing thing we are about to witness. Slowly from the brush emerges a fat, little Kiwi clucking along and digging here and there with the tip of its bill into the sand. It never once takes notice of the naturalist crawling around along side it. The kiwi's alien like looks, and focused digging, up against Attenborough's schoolboy awe is priceless.